Posted on July 18, 2017 at 09:41. “Going green to get around is the single, most effective way we can help transform Brisbane into a sustainable city”. Brisbane City Council, Our Clean, Green, Sustainable City 2017 – 2031. Environmental sustainability is just one of the many benefits of cycling to work. Along with reducing congestion, making the city more liveable, and being a cost-effective means of transportation, most importantly, it promotes healthy living and wellbeing. The Brisbane City Council’s 2017 – 2031 Sustainable Strategy initiative to reduce congestion, fossil fuel consumption and emissions, has a large focus on expanding active transport networks, particularly for cyclists. Specifically, the council suggests that end of trip facilities are key to promoting active transport. The plan mentions Cycle2city as the first major end-of-trip facility in Australia, and the pivotal role end-of trip facilities, such as Cycle2city, have in promoting active transport. Commence a new $100 million bikeway infrastructure program to create connections in Brisbane’s top employment areas and improve bikeway links across Woolloongabba, Toowong, Kangaroo Point and Indooroopilly. 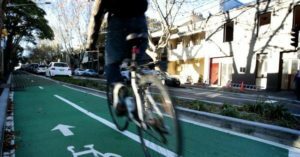 Integrating cycling opportunities into major road projects such as the Kingsford Smith Drive upgrade. Continue to convert key suburban streets linking homes to shops, schools, parks and other important places to ‘shadeways’ with more large street trees and better footpaths. Transform major arterial roads and key streets in the city core into shady, people-focused subtropical boulevards. Use new development to expand and fill in missing gaps in walking and cycling networks across the city. At Cycle2city, we promote active transport and living by providing cost effective, state-of-the-art end of trip facilities that make commuting by bike or walking/running enjoyable and efficient. It is facilities, like Cycle2city, that are pivotal for maintaining the sustainability of our beautiful city.